The National Front has said it will not stage an anti-gay protest at Saturday's Reading Pride event, despite seeking permission from police to do so. 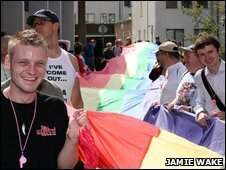 The organisers of Reading Pride said police had warned them that the extreme right-wing group planned to protest. A National Front spokesman said the group did not want to interrupt the parade, but had wanted the right to peacefully protest. Police said they would still attend "to maintain public safety". A parade will make its way through the streets and the Market Place to the festival site at Kings Meadow Park. A spokesperson for the event said: "Reading Pride celebrates diversity across the Thames Valley and aims to eradicate discrimination against members of the LGBT [lesbian, gay, bisexual and transgender] community. "It is through the parade and festival that the charity hopes that visibility will assist educating members of the public. "Reading Pride believes in equality, diversity and freedom of expression from all groups in society. "We value all opinions both culturally and politically. "We are more than happy to open dialogue with any group and hope that we could learn from each other." Ch Supt Richard Bennett, of Thames Valley Police, said: "We will liaise with the event organisers to ensure that this day passes off safely and with minimal disruption."